Burton Gray’s “NORM,”sad, mouthless robot at a bar. 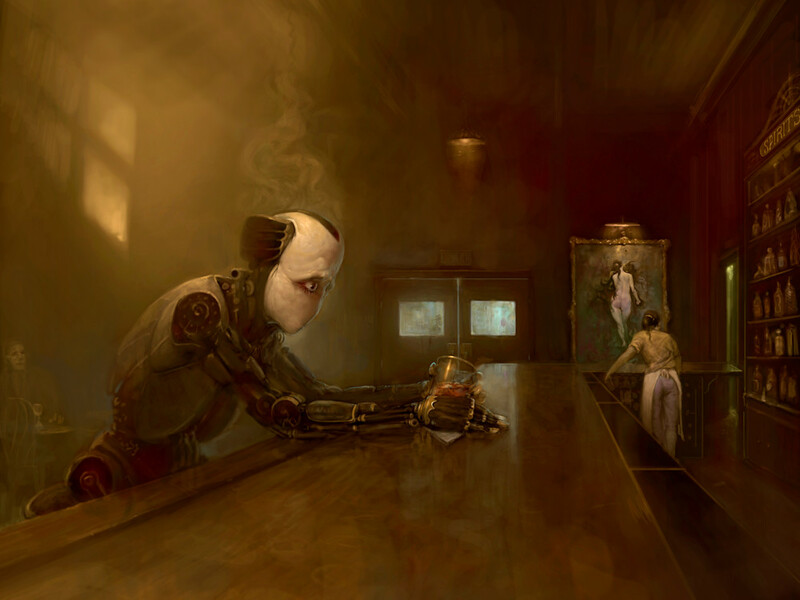 NORM: Everyone loves NORM, but hopefully you can't relate too well to the mouthless Robot sitting alone at a bar in the middle of the day looking longingly at a whiskey he holds but can not taste. Metaphor for unrequited love, lost ambition, and emotional isolation. This version of NORM has an expanded composition, mainly intended for larger versions or for people who want print for a classic frame size - such as a 30x40" frame. Original version of NORM is a very cinematic/wide 2:1 ratio that keeps reads cleanly from left to right - this version allows eyes to wander a bit. Which one is right for you depends on your space and personal taste. If not certain which ratio is right for you email me with a short description of space you plan to hang and I'll let you know what I think would work best. Frames are never necessary but NORM is an image that would benefit from being displayed in a frame and viewed as a window into another world. Do to it’s muted palette I feel stretched canvas (most economic medium) is perfect for this image. Acrylic would look cool but not worth the added expense, unless of course, you plan to hang in an upscale modern space. Since image is of a robot White Metal might be fitting but not necessary to appreciate the image. Framed print option only if that is your preferred style and mat only if you love mats. My robots show how people relate to the technology of our time - digital technology and social media. Series explores the psychological ramifications of living in a world we so often feel but can not touch. I wonder if the accumulation of emotional connections without the corresponding tactile associations (of feeling the ground, breathing the air, seeing the details of a person standing before you) effects our psyche in a significant manner. I fear these half memories create a neurological imbalance that leads to abnormal behavior, a feelings of isolation, and a general disconnect from social norms.